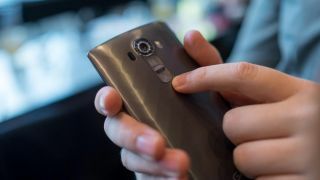 LG G4 release date: where can I get it? The LG G4 has started to ship, so whether you're taken by the plastic version or fancy splashing out on a leather backed model we've got all the details you need right here. The high street retailer has the LG G4 in stock and on sale, with a free leather backed handset in black (exclusive to Carphone) or brown setting you back £35 per month. It's also offering the grey, plastic backed model - but it doesn't look or feel anywhere near as good as the leather. While the black and grey models are only available on contract, the brown leather LG G4 can also be snapped up for £519.99 SIM-free - although it can be had cheaper elsewhere (scroll down a bit!). The bubbly network has the LG G4 in stock, with the Metallic Grey and network exclusive Genuine Leather Brown colours available to buy. You can pick up a free LG G4 from just £33.50 per month, which would get you 500 minutes, unlimited texts and 500MB of data. Pay £41 each month and data goes up to 3GB and both minutes and texts are unlimited. There's a PAYG option with O2 too, with the LG G4 setting you back £479.99. You can buy the LG G4 from Vodafone, where you have the choice of metallic grey or red leather - that latter of which is currently exclusive to the network. If you pre-order the red leather G4, it will even throw in a free gold plastic back cover for you to swap around. The G4 is free on tariffs from £35 per month and upwards, with Vodafone highlighting its £45 per month Red Value Bundle which gives you unlimited calls and texts, 4GB of data, 6 months of Now TV, Spotify or Sky Sports and free calls to the UK when in Europe. Three has now confirmed it will be stocking the LG G4 and it will have exclusivity on the white ceramic version until the end of June. Three offers benefits such as the Feel At Home feature, which offers your calls, texts and data in 18 different countries around the world as if it was the UK. If you're keen to get the G4 from Three make sure you register for updates on its website to be kept in the loop. The UK's largest 4G network has not revealed whether it will be stocking the LG G4 but we're bound to see it appear in the coming weeks. TalkTalk has been in contact to confirm it will be stocking the LG G4 but hasn't confirmed any pricing details or which versions it will stock yet. Clove has stock of the LG G4 and colour options for the handset include the tan leather version for £509.99 SIM-free, or the grey and gold plastic-backed models for £489.98 a pop. Online retailer Unlocked Mobiles also has stock of the LG G4. You'll can pick up the LG G4 SIM-free in grey or gold for £499.87, whilst the black leather and brown leather versions will cost you £529.87. MobileFun has the leather backed LG G4 listed at £520 in either brown or black. The grey and gold plastic versions are priced at £499.